Have you ever sat back, looked at the East Coast, and wondered what exactly we do during a hurricane? Do we sit huddled in a corner waiting for the roof to cave in? Do we count our copiously stockpiled provisions? Do we go surfing? The answer is that someone, somewhere is doing all of those things. But we don’t stop there! No no, we don’t take the hurricanes lying down. We go out and beg them to leave us alone! What? You don’t believe me? Oh, then you need to watch this. For reals. Today was the first day of my last semester. No, I can’t believe I’m typing those words either!!!! As I drove to school this morning, I got to thinking (dangerous, I know…but it can’t be helped). It seems like just a few days ago that I drove the same car to the same parking lot, walked into the same building, and wandered the same halls searching for the elusive room numbers. At the same time, I remember every agonizing moment of each quarter: the growing pains as I adjusted to a classroom setting, the frantic pace of the eight-week classes, and the never ending panic attacks ensuing from technology that would never behave quite correctly. I tried to focus on the good parts of today. Sure, there were the frustrations. Like large classes being shoehorned into awkward rooms, annoying freshies whining to their mummies about poor time management on the phone in the library, and the sneering arrogant attitudes of “those” students on campus. BUT there was good too. Like the people in both my classes. Like getting to sit next to classmates that I’ve known for years now, catching up on summer fun, sharing class schedules and plans for the future. Like sitting in the library for a few hours and getting homework done. Like discovering hidden gems in my textbooks that I can instantly start applying to my life. Like loving my professors. Like enjoying the beauty of campus on my two LONG WALKS from one end to the other. None of this hit me until halfway through my last class. There I was, laughing at my professor’s jokes, swapping whispered comments with my friend sitting beside me, and I realized that I was having fun. I was finally sitting back and enjoying the process. I wasn’t worrying about what classes I’d have to take in the spring, if the course schedule would come out soon, if my grades would dip my GPA below scholarship standards. I wasn’t worried about having to save some brain cells to make it through the next semester too. I was just enjoying the process. My goal is to keep that zen feeling throughout the next 17 weeks. 17 more weeks…then I have my Bachelor of Arts. It dawned on me today that unless my university totally messes up the class schedule for next Fall (and that is not beyond the realm of possibility), this will be my last Spring semester, the last time I’ll take sessions C and D. Trust me, this is totally sweet with no bitter-ness anywhere in sight. I’m ready to be done with college. For reals. With that end in mind, I’m tackling 5 classes this semester, something I’ve only tried once before. Due to a professor who apparently didn’t understand the difference between a 100 level and a 400 level class, it didn’t go too well – I ended up dropping a class. For those of you who don’t understand why this is even a big deal (because, let’s face it, most traditional students take 5 classes a semester), allow me to explain. My university is nontradional. Because we started as a graduate school, undergrad classes were an afterthought mostly just so people a few credits short of a Bachelor’s could finish up and move on with life. Undergrad classes, then, only lasted 8 weeks. Before you go all “how cool is that” on me, let’s make sure we are on the same page. Imagine all the class work you do for an entire semester. Essays, papers, research, projects, tests, midterms, finals, the works. Now, instead of having 4 months to complete those assignments, you only have 8 weeks. To top it off, you either don’t get a class on campus, or you only get a two hour class every week. To make up for that, you write mini-essays every week and then reply to your classmate’s essays. This is ON TOP of everything else. Recently, the undergrad program underwent some changes, and we are starting to transition to more traditional schedules. New classes are 16 weeks and on campus, meeting twice a week for an hour and some minutes. To be honest, after 4 years of rapidly cramming information into my head in a two week period, it can be hard to adjust to the pace of a slower class. The temptation is to put the assignments on a back burner because they feel less “urgent.” Or maybe that’s just me. This semester, I have one 16 week class. 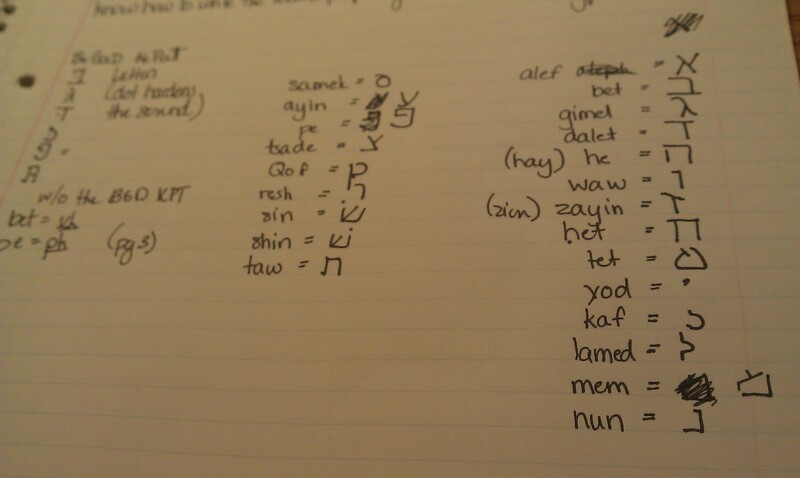 We’re studying the Psalms, and the class is amazing! It’s taught by one of my favourite teachers, and taking it means that I’m almost finished with the Biblical Studies minor part of my degree. For the next four months, we are taking apart the book of Psalms, looking at structure, form, meaning, cultural relevance, and spiritual application. 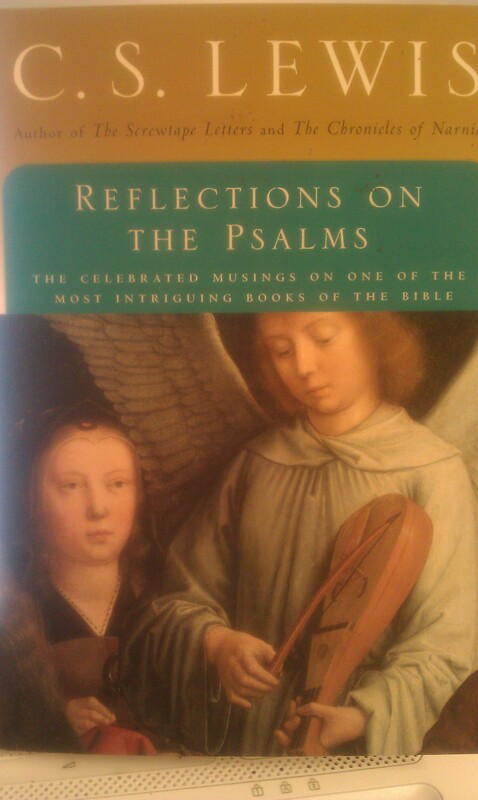 If you are interested in a non-scholarly approach to the book, I can’t recommend C. S. Lewis’ Reflections on the Psalms enough. It’s simply brilliant. Yeah, this is going to be a great class, and is already sparking some ideas for blog posts. You’ve been warned! Then, this session I have two 8 week classes. Tuesday nights are helping me finish up my cognate (mini-minor) in Speech and Communication. We are studying Rhetorical Criticism- a research method that helps you identify the purpose and effectiveness of various communication symbols. Over the next few weeks I’ll be writing papers on song lyrics, the State of the Union Address, SuperBowl commercials, and print ads. It’s going to be great fun, and I have a feeling that some of those papers will end up here too! Last, but not least, I’m taking Milton and the 17th Century. This makes my English major’s heart very, very happy. I’ve never been a huge Milton fan, but his writings are so foundational to other English works that I know it will be a great course. Frustratingly, I can’t seem to get that textbook to come in (*mutters under breath about university bookstores not being quite forthcoming with information about shipping issues*)…but I’m hoping to have it tomorrow. I’ve taken every English literature class with this professor, and she’s awesome! It’s nice to have this class with her. That’s the bare schedule that I have going on. There are a bunch of other things going on in the next 8 weeks too, but they’ll have to wait. I’ve got to go study! It’s finals week! Yay because that means Fall Break is literally right around the corner, and Boo because that means I’m knocking myself out with studying this week. This is the first quarter EVER that I’ve not had a major paper due. It feels weird. 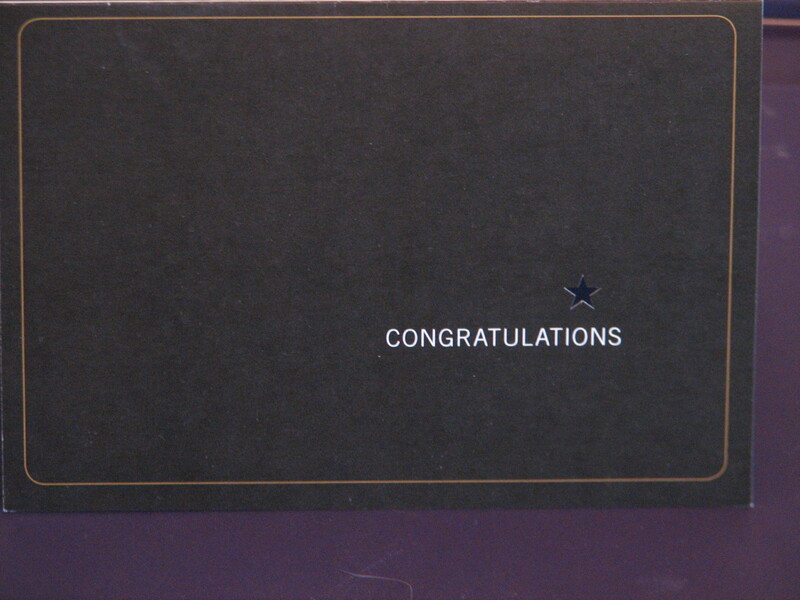 It’s also the first time I’ve had a 100 question closed book final. Yikes! Because I’ve been slammed, I haven’t had much time for blogging. So, I’m just going to steal a post from my teaching blog since it was pretty interesting (if I do say so myself). We were studying ballads; specifically the criterion for a traditional ballad. Ballads were the poetry of the common people. “Serious” poetry was composed in French or Italian. Ballads were the way for the commoners to record their stories, history, thoughts, and ideas. Since they were not able to write down their stories, it only made sense to put those words to music so they wouldn’t be forgotten. The best ballads are of Scottish and/or Irish descent, and they mimic the highbrow poetry of the time. Can you think of any other modern ballads that fit the old-fashioned criterion? Leave them in the comments! We all have a certain way of viewing ourselves. Sometimes it is positive, and sometimes we are pretty hard on ourselves. So, what influences our perceptions of ourselves? This is the question that we dealt with last week in one of my communication classes. It was a very interesting topic, so I thought that I’d share my most recent paper on it with you all! If you don’t have that kind of time, then you can skip straight to my paper. Enjoy! Three people are sitting at a table smoking: a fit boy from Bosnia, an incredibly slim woman from the Philippines, and a slightly overweight woman from America. They are three amazingly different people with one thing in common: where they are from, their body image is not acceptable. The boy is not skinny enough, the woman is too slim, and the other woman is not skin and bones enough to fit her country’s “ideal” fantasy. As they look at each other, each of them envies the other’s body type, and cannot understand why the other people are unhappy with the way they look. This is the sort of observation that interested Myers and Biocca, and led them to conduct a study on media’s influence on young American women and their perception of their body image. What they concluded is that women hold three different images in their heads; the socially acceptable body, how they perceive their own body, and what their body really looks like (115). In order to understand why this is, Myers and Biocca evaluate the persuasive techniques of television advertisements to discover why women deal with this “elastic body image” (108). The first thing that Myers and Biocca noted was that women are convinced when they look in a mirror that they are fat, and that this repulses them (109). Wood defines this phenomenon as a facet of nonverbal communication, stating that “based on physical qualities, we may make inferences about others’ personalities” (100). She deduces from this observation that people try to alter their physical appearance to fit an accepted “norm”; wearing contacts instead of glasses, coloring their hair, wearing makeup, and constantly dieting (101). This repulsion, however, is mostly a European/American construct. In other cultures, a larger figure represents wealth and beauty (100). Thus, the question must arise as to why American women are attracted to a slim body image and repulsed by a larger one. The simplest answer can be found, as Myers and Biocca discovered, in advertising. For example, women want to be sexually attractive. If the models and actresses that advertisements show as desirable to men are super-slim, then women will create a subliminal observation that to be desired, they must be thin (Larson 407). Unfortunately for the average woman, “thin” will never seem thin enough. Every year the average weight of actresses and models drops (Myers & Biocca 113); women can never keep up. At the same time, scriptwriters and advertisers create a conundrum by creating what I call the “Gilmore Girls” effect. In the show Gilmore Girls, the two main female characters were always eating, consistently refused to do any sort of exercise, and yet somehow managed to get slimmer with every passing season. It is impossible to live their life and look as great as they do, a ploy used by television producers that is unfair to women. The most interesting part of the study was the overall result observed by Myers and Biocca. After subjecting each woman in the study to a series of advertisements specially picked for their portrayal of women’s bodies, the women overwhelmingly portrayed their body as slimmer than they had before the study (127). The best conclusion that made is that this idealizing gave women hope that they may one day look as great as the women portraying the perfection in body image (127). Women like to conceptualize and idealize; if they see that someone has attained so-called “perfection”, then there is still hope that they may attain it as well. Christian women know from reading the Bible that “charm is deceitful and beauty vain, but a woman who fears God is to be praised” (Prov. 31:30). They know that the “hidden man of the heart”(1Pet. 3:4) is more important to God than any physical beauty. However, the impact that society has on our minds is clearly seen in Myers’ and Biocca’s study. The persuasive techniques at play here are subliminal, entering the subconscious without any cognitive recognition from the rational part of the brain (Larson 407). As a result, womens’ physical perceptions of themselves and others are skewed, thus their eternal struggle with diets, makeovers, and reinventions. It is time for society to stop demanding an ever decreasing waistline from women, and to start focusing on things of more worth than physical appearance. I’m posting to prove to you, my dear readers, that there is a reason I’ve not been posting more often- I’ve been writing papers like this. Thank you for being so faithful to check in with me! Over the summer I hope to be a little more faithful with my posting. This paper is based on about the only enjoyable story I read in my American literature class this session. The story is narrated by a woman who is suffering from a slight nervous breakdown, and her doctor/husband takes her and their son to a new house for the summer. Unfortunately, he chooses to put them in a room with hideous, mottled, fading, peeling yellow wallpaper. This wallpaper eventually drives her to insanity; she first imagines that there’s a woman trapped behind the design of the paper, and in the end she thinks that she is that woman attempting to escape. In Charlotte Gilman’s short story “The Yellow Wallpaper,” Gilman explores the inner workings of a woman’s mind. This is not a story of an ordinary, happy, carefree woman though. Instead, this woman is struggling with her grip on her family, health, and even her sanity. Through her decline and eventual mental breakdown, the only change in her life is in the amount of contact her husband, John, allows her to have with nature and the outside world. Thus, “The Yellow Wallpaper” exemplifies the idea that disconnection with nature facilitates a decline into insanity. From the very beginning of the story, the woman admits to having had health issues recently. So far she, under her physician husband’s direction, has coped very well with her infirmity due to certain measures which included “air, and exercise.” Her only complaint with this method of treatment is that she wishes for a little more excitement, but overall she is content with her life and her stabilizing health. As she describes the summer home they have rented for the summer, she goes into raptures about the state of the grounds. The most beautiful place!…It makes me think of English places that you read about, for there are hedges and walls and gates that lock, and lots of separate little houses for the gardeners and people. There is a delicious garden! I never saw such a garden—long and shady, full of box-bordered paths, and lined with long grape-covered arbors with seats under them. The garden is the real focal point of the house for her. She is not fond of the building itself, nor of the room that John assigns to them for next three months of living. Again, her dissatisfaction only comes out of her love for, and need to connect with, nature. The room she wanted opened out on to the rose garden, but the room John chose is on the top floor—as far from the garden as is possible. Out of one window I can see the garden, those mysterious deep-shaded arbors, the riotous old-fashioned flowers, and bushes and gnarly trees. Out of another I get a lovely view of the bay and a little private wharf belonging to the estate. There is a beautiful shaded lane that runs down there from the house. Here the reader gleans the first inkling that the woman is not going to be mentally stable for much longer. As she glances out the window to the lane, she admits to the fact that her vivid imagination is beginning to take over reality, and she fancies that she sees people walking about. As the summer wears on, she tries to keep her tenuous grip on her connection with nature. Even into July, she is able to get out from under the spell of the mysterious and all-consuming yellow wallpaper and make it into the garden. She writes that “I walk a little in the garden or down that lovely lane, sit on the porch under the roses, and lie down up here a good deal.” At the same time, her focus turns inward to the room and the wallpaper. By the middle of July she is spending hours gazing at the wallpaper, and ignoring her direct examination of nature. In fact, the only mention of natural elements comes from their attempts to make contact with her. She talks about that moonlight, and how “the moon shines in all night when there is a moon.” Even though she is not consciously attempting to connect with nature, it does its best to reach out to her. I see her in that long shaded lane, creeping up and down. I see her in those dark grape arbors, creeping all around the garden. I see her on that long road under the trees, creeping along, and when a carriage comes she hides under the blackberry vines. Nature, in the woman’s mind, has turned from being an escape and a respite to being just another arena for her imagination to dominate. Nature is tainted by her dark fancies, and by all apparent signs her madness is, at this point, complete. As a final interaction with nature and a last example of how far her mental breakdown has gone, the woman uses a plantain leaf to hide the key that locks her husband out of the house. The transformation from health to insanity is complete in her life, and her use of nature proves this. Where at the beginning of the story nature provides an escape and a link to sanity, here at the end of the story nature has become a tool to aid and abet her madness. While it is impossible to tell if the outcome would have changed had the woman been able to maintain a healthy connection with nature, during her lucid times she seems to think that nature would help her in her illness. She seems to know instinctively that a room opening up onto the gardens would be better for her than the horrid room at the top of the house. Although she tries her best to make the most out of a horrible room and living situation, her best efforts fail. In the end, she becomes as warped as the wallpaper in the room, the antithesis of the lovely, unblemished, holistic beauty that she could once admire in nature. As distortion sets into her brain, one of her last acts of madness is to turn nature to suit her own insane purposes. Her disconnection with nature is complete, as is her lapse into insanity. 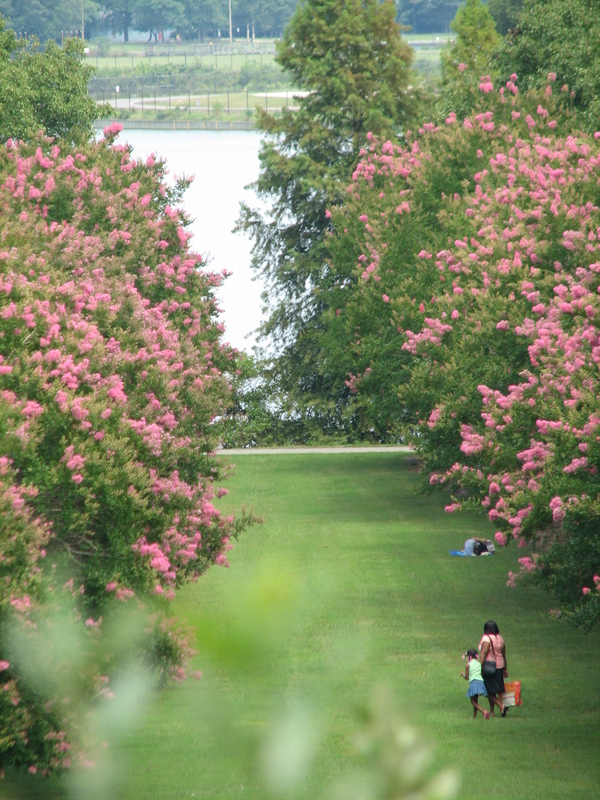 Photo of Crepe Myrtles, taken at the Botanical Gardens last summer. For the few of you out there who do not yet know about my feelings towards American Literature, I have some very strong ones: I don’t like American Literature. I’m currently taking an American Lit class only because I would LOVE to graduate sometime this century. Nonetheless, I believe in giving everything your best effort as much as you can. So, let it come as a little shock when I say that reading the poetry this week was almost bearable. Almost. That is blowing in the same bare place. This last stanza really captured my attention. The poem, though nicely balanced and arranged, is somewhat bleak. The landscape described is blank, desolate, frozen, and harsh (did you notice how Stevens used the words “crusted”, “shagged”, and “rough” to hint at harshness without coming out and using the word?). It doesn’t seem to bother the speaker (as it bothers me) that in looking to the snowman for an unbiased view of the world, the speaker is effectively placing his own bias on what he imagines the snowman to see. In reality, the speaker can find nothing worthwhile in the world around him, and the snowman becomes merely a vehicle by which the speaker can justify and rationalize the perception of meaningless life. Life may be nothing, but for the speaker, nothingness must actually exist. If nothingness is not real and tangible, then the speaker realizes that he is most likely missing out on something huge in life. This appears to scare the speaker, thus he chronicles his winter quest to justify (ironically) the existence and purpose of nothingness. He creates this blank landscape, finds a blank “mind”, and creates a situation where nothing actually exists. He thinks that this will make him happy, that if he can achieve this goal he will no longer hear mournful wind and see harsh landscapes. Everything becomes nothing, and nothing is everything. The only problem is that this world that the speaker creates is quite…well, depressing. So, I’ve shared how I read and interpret this poem. Why don’t you all take a moment or two to jot down in the comments what you see in the poem? I promise to respond! Thanks to this transcript of All Things Considered for affirming that my interpretation is not completely off the wall! While the elite athletes of the world were up in Canada winning gold medals, I was working on a more important gold award. 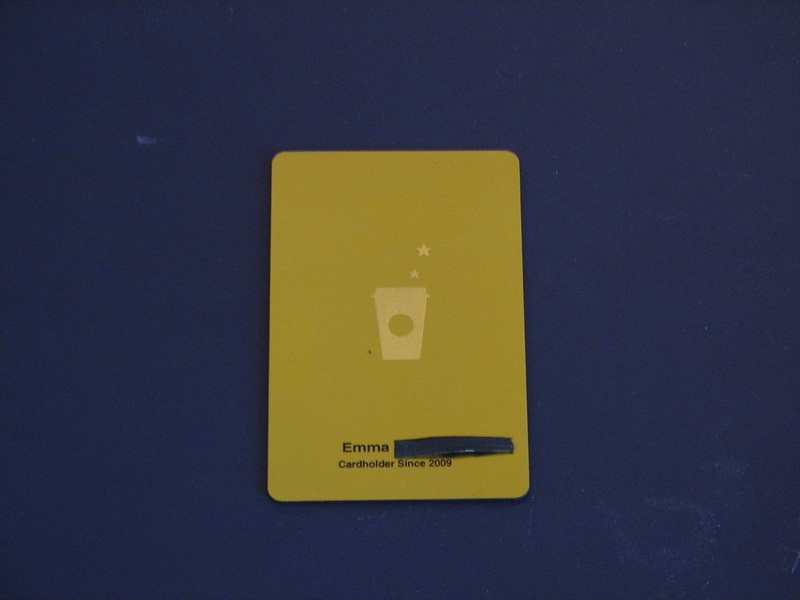 That’s right folks, my Starbucks gold card came yesterday! …where they wrote me a cute little note. Best of all, it comes with a free drink coupon! So there you have it! 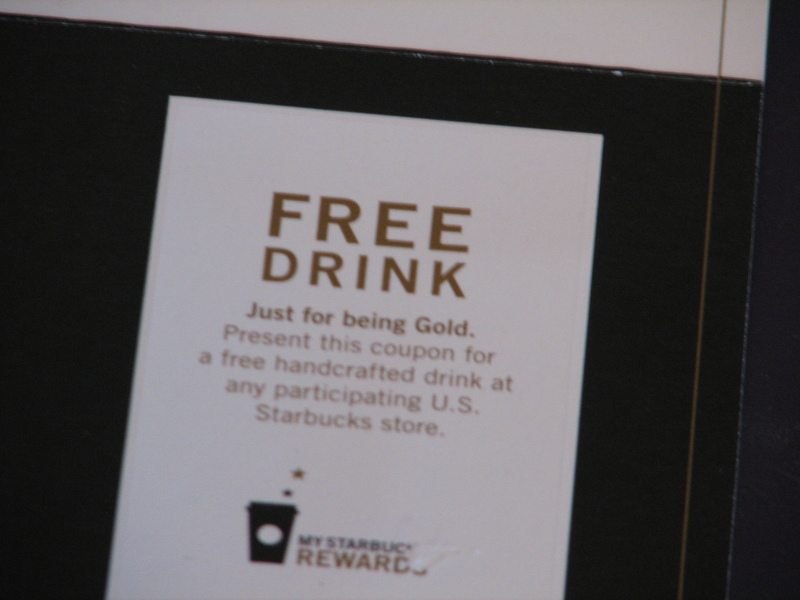 Make sure that you don’t just throw away the note from Starbucks- you don’t want to miss out on every great benefit the new Gold Card Program has to offer. Happy star earning! Yes, this is all very exciting! Now, I’ve got to go get some coffee. It’s been a few weeks since I’ve blogged something substantial, but please don’t give up on me! Truth is, I have about 8 blog posts started, but I get distracted and haven’t had the time to finish them. I will, I promise! -Write 500ish words on Christians and the spirit world. -Respond to 2 other people’s opinions on Christians and the spirit world. -Write 2-300 words on Dr. Jekyll and Mr. Hyde. -Write a 7-9 page paper on Dickens’s use of children and their effect on Scrooge’s character in A Christmas Carol. -Write 2 formal essays encapsulating everything I’ve learned about Victorian literature in the past 8 weeks. -Take a reading proficiency quiz. -Take a two hour exam on a month’s worth of reading materials on cults (the last test crashed on me half-way through, so this may do the same). -Find and distribute copies of a play my club is reading to seniors next month. All this to say if I’m not around here much, please don’t leave! Once things settle down we’ll be back to our normally scheduled programming. See you soon! How about one of my favourite YouTube videos to keep you entertained while I’m gone? Watch it to the end; it cracks me up!